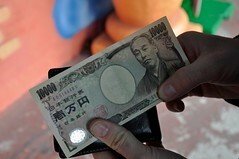 TOKYO – Japan’s sales tax will be doubled within the next three years in order to help reduce the national debt level. On August 10th the parliament of Japan ended months of ongoing debates on the issue of taxation by approving a proposal to double the rate of the country’s sales tax in order to raise extra revenues to help tackle Japan’s worsening fiscal position. Currently the sales tax in Japan is set at 5 percent, but will be raised to 10 percent by the end of 2015. The extra revenue collected will be used to supplement the national budget and reduce the deficit and aid the government in reducing the national debt level. Analysing the potential revenues streams from the new tax hike, experts in Japan have already said that the increased revenues will not outweigh the rising cost of funding the country’s superannuation system, which is currently growing by more than JPY 1 trillion per year. The ruling Democratic Party of Japan (DPJ) has been calling for an increase to the sales tax rate since September last year, but the move has been delayed by political disagreements from within the party itself and also from the main opposition party the Liberal Democratic Party (LDP). Last week the LDP agreed to support the tax hike in exchange for a promise from the Prime Minister to call an early election in the near future.